SmokingCrayolas' entry in the Video Association of Dallas' 9th Annual 24-Hour Video Race. This year's Video Race saw SmokingCrayolas' once again in the "Guerilla Division" with a core team of four members. It would have been five, but Todd had a last minute work entanglement and was unable to participate from start to finish. Fortunately for us, he was available for a quick cameo, doubling our number of extras. Dialogue: "Is that all there is." This year marked the first year one of us was awake the entire 24-hours. That one of us was me. As soon as we finished the script, I immediately got to work on logos and animation. And that's pretty much what I did all morning, even staying home while Niki, Kirk and Jake shot principal photography. We filmed all of my scenes last, after Kirk was already editing the footage shot on location. The editing process went well, and while there were some post-production elements we didn't get to add (McBoxy logos/ads on the building, news-style names at the bottom of the screen), we think we pared the too-long-for-competition work print into a solid five-minute final cut. However, en route to the finish line, we once again steeled ourselves for an "out of competition" finish. Not because of any errors on our part, we learned about file exporting last year and left ourselves plenty of time to spare. Our problem came in the form of a nasty accident on southbound I-75 that had traffic pared down to one lane. We were able to squeezecrawl past the traffic just fast enough to give us a glimmer of hope? only to hit a mind-boggling amount of traffic at Mockingbird Station. Apparently a rather trendy club or two has opened since last year's race and midnight is when the place really starts hopping. Where these crowds were Friday, I've no clue. Beating the crowds is where Todd, again, came in handy. Work had slacked off enough that he was able to meet us at our house at 23:00 hoping to get a glimpse of our final product. With the file exporting on his arrival, he had no choice but to accompany us if he wanted to see the finished film. Crammed into the back alongside Jake and Kirk, he had door access when we pulled into Mockingbird Station. Niki handed him the drive and he sprinted past the lines of traffic, into the Angelika, up the escalator, and across the finish line. It was 12:05. But all was not lost. A late start to Bart's film announcing the elements pushed the race's start back just enough that we managed to squeeze in less than 24 hours after the race began. A win for the punctuality of creative types everywhere! 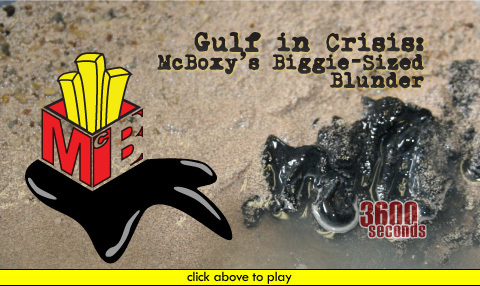 Update:McBoxy's Biggie-Sized Blunder went on to take 3rd Place in the 2010 Guerrilla division. This marks team SmokingCrayolas' first 3rd place finish, third "medal" finish, and the fourth consecutive year we advanced to the finals. Apparently Jake really is our good-luch charm!